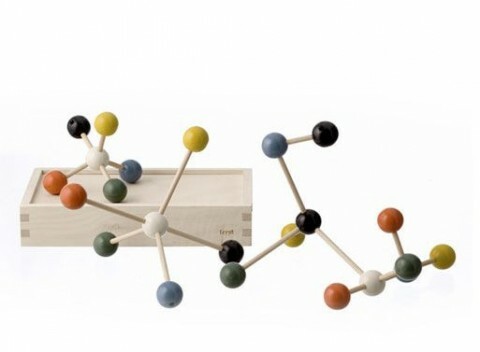 I might just have to order one of these Molecule Building Sets for my office. A beauty, no? Each set consists of 24 molecules atoms made of wood (6 colors, 4 of each) and wooden sticks to connect the dots and turn the molecules into your own unique design. I have been wanting one of these myself for a while. I suggested one on Etsy to my friend for her scientist boyfriend a couple months ago and have since been scouring for an inexpensive one myself. I don’t care much for science, but I love the look of atoms and molecules. Cute and smooth, but you and your readers might be better served by the same thing with twice the parts at less than half the price.